Nick Cammarata was a healthy young adult who loved to swim, read, build legos, and play videogames - just like any other 12 year-old boy. In June 2008, he developed a simple rash, which his family thought was nothing more than a side-effect to the antibiotic he was on. Nick went back and forth to the doctor, and trip after trip nothing was determined. After these numerous trips to the doctor, he got a blood test. One month later, on July 4, Nick was diagnosed with Acute Lymphoblastic Leukemia (ALL). Nick's type was T-cell, which is a harder form to cure. Nick went through 4 grueling months of intense chemotherapy. After the chemo, he was in remission, but now needed a bone marrow transplant. 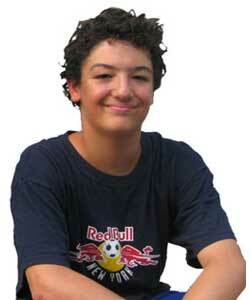 On October 26, 2008, Nick passed away from complications from his treatment. The Cammarata family has started Nick's Fight To Be Healed Foundation to reflect Nick Cammarata's values and personality. By helping other patients with blood cancer his spirit lives on. The mission of Nick's Fight to be Healed Foundation "is to support pediatric blood cancer patients as well as serve the young adult blood cancer community. We strive to improve quality of life by promoting well-being, reducing stress within the entire family, and providing resources to help children with blood cancer lead fun and fulfilling lives." Nick's parents, Janine and Lucas Cammarata, are President and Vice-President of Nick's Fight to be Healed Foundation. Together, with the help of a Board of Directors they support young adults to have an easier experience battling their sickness. Together, they experienced first-hand how the battle with cancer changes a family, taking a toll on everyone involved. They understand the financial struggle of making ends meet while a family member is sick. They understand the need to spend time with your child in the hospital while maintaining a full time job and taking care of a family at home. That is why they want to reach out to other families who are in the situation they were in. They want to lend a hand. Nick loved all things medieval - dragons, knights, castles. He loved reading fantasy stories, especially King Arthur. The dragon in the logo comes from one of Nick's dragon books. It is a wyvern, a legendary winged creature with two legs and barbed tail often found in medieval heraldry. The shield and sword was thought up by Lucas, Nick's father, which matches the memorial he placed at Nick's site. Nick chose the red and black colors and the "Fight to be Healed" slogan while friends and family were raising money to help with his medical bills. Designed together, the logo represents the spirit of Nick that will shine through to other children defending themselves against cancer. Financial Support - Providing financial assistance for pediatric blood cancer patients to help with bills, food, gas & other basic essentials families need to help them get through this time. Comfort Bags - Providing the teen comfort bags to pediatric blood cancer patients (ages 10-25). Comfort bags include fun distractions and things to do such as books, DVD's, music, videogames, cozy socks, new clothes or toys. Each comfort bag is personalized to fit the needs and interests of the patient at hand. They work with the clinic's Child Life Specialist filling out a survey so the foundation can create the comfort bag unique to each person. The idea is to help them feel special and not secluded. Entertainment - The clinic is equipped with flat screen TV's in each room as well as the waiting room. The Foundation annually donates current DVD's, video games, books, magazines, audiobooks and games for lap top computers. Child Life Specialist Support - This position, along with many others at The Melodies Center for Childhood Cancer at Albany Medical Center is funded solely by donations and grants. This position is so vital and positive for pediatric cancer patients that it is part of the Foundation's mission to help fund it. Provide fun distractions for teens and their families by purchasing tickets to their favorite sporting or entertainment events.